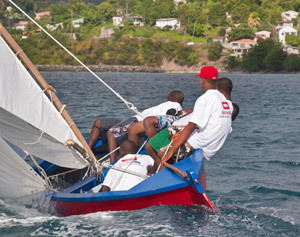 Grenada is a seafaring island with a long history of sea trading, fishing and boat building and even today this tradition remains one of the strongest influences in the local culture. 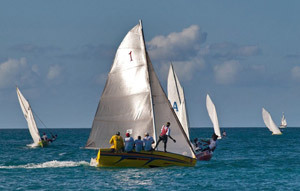 The friendly rivalry that has always existed between closely knit communities has often been expressed in competition amongst fisherman and their boat-builders to be the fastest or the best, developing into organized regattas taking place regularly over the years. 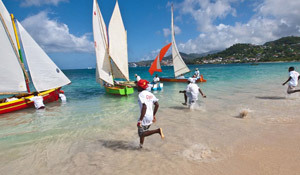 Traditionally, the local community racing calendar has been centred around key times of celebration and holiday: Easter; Whitsuntide; Fisherman’s Birthday (29 June – the Saint’s Day of St Peter & St Paul); Carriacou Carnival Regatta (August). 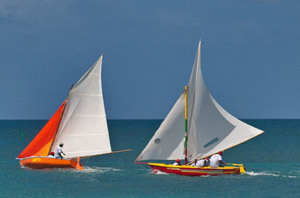 In latter years these have been joined by ‘newer’ dates such as Thanksgiving (October – to mark the intervention of the USA in Grenada in 1983) and the Grenada Sailing Festival Work Boat Regatta (Every January since 1994). 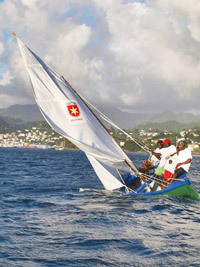 At the annual Grenada Sailing Festival Work Boat Regatta sailors take part from Grand Mal, Gouyave, Sauteurs and Woburn, plus Sister Islands of Carriacou and Petit Martinique – communities with a strong sailing and boat building heritage. 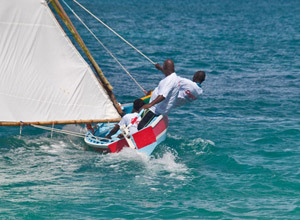 Traditionally the boats raced were the working fishing boats of the community – 16 or 17 feet long, made from local hard woods and with masts of bamboo. Today boats are built specifically for racing and are carefully stored and maintained to be ready for competition. 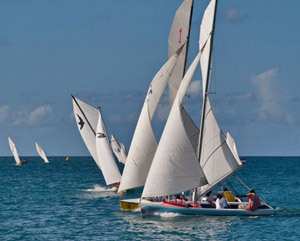 On average it takes four to six weeks to build a boat from scratch at a cost of some EC$7,000.00, plus EC$4/5,000.00 for a full set of sails. 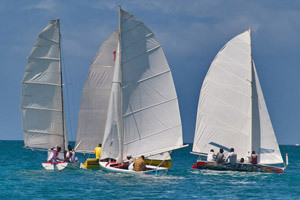 With good maintenance and storage, these boats are likely to last about 10 years, with sails needing to be replaced more regularly, depending on the wear and tear of the racing season. 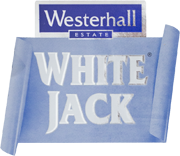 This represents a very big investment and shows the strong commitment to the tradition still in existence. 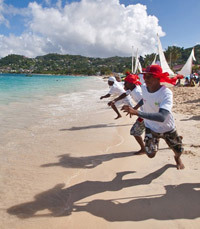 On Sunday afternoon the winners of the community classes race against each other using the one design GSF 16s – the fleet of boats that Grenada Sailing Festival had built specifically for match racing. 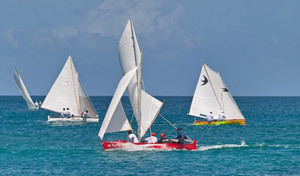 This fleet of boats is also used for the very popular National Team Sailing finals where each community nominates a junior and senior crew to race. This is a very high profile competitive end to the regatta and generates tremendous community support for the participating crews.